Hostel Jasmin has the best possible location!!! 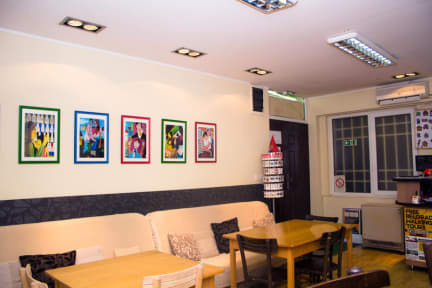 Just across main bus station, 50m from the train station, in the city center!!! FREE: internet, WI-FI, air-conditioning, coffee, tea, walking tours, car and bicycle parking, lockers, luggage storage, welcoming and good morning drink, linen, towels (we are changing towels on a daily basis), laundry and ironing service, maps and brochures about Belgrade and more!!! In the center of Belgrade just 5 minutes walking from greatly interesting night clubs/boats on the river on one side and most visiting tourist attractions in other. spacious, air conditioned rooms with free Wi Fi , parking space, computers with access to Internet and much more. All rooms are air conditioned. The building is under video surveillance and security staff are on duty 24 hours a day.Our kind stuff will gladly answer any queries the guests might have and advice them in planning their free time. The location of the hostel guarantees an easy and quick access to remote parts of the city. Besides, in the close vicinity of the hostel there are shops which are open 24/7, a 24/7 pharmacy and numerous fast food restaurants. 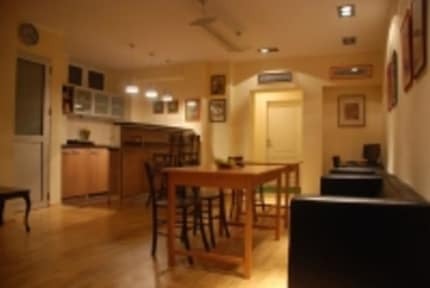 Moreover the guest have free wireless internet access, computers for informing about Belgrade happenings and fourder traveling, a safe and secure storage room and a gentlemen's and ladies bathrooms at their disposal. The very downtown in which the Hostel is located five minutes from the center of city across the main bus station in CITROEN building, enables you to get to Kalemegdan (the Medieval fortress), Knez-Mihailova Street (the pedestrians' zone) or Skadarlija (the bohemian quarter) in 10 minutes time, without the need to use the city transport (by walking). Für alle Zugreisenden ist die Lage (5 min zu Fuß zum Bahnhof) sehr praktisch. Endlich mal ein Hostel mit funktionierenden Schließfächern! Die Mitarbeiter waren sehr nett und hilfsbereit. Das Bad geräumig und sauber. Einziger Kritikpunkt (nur aus subjektiver Sicht): Irgendwie hat man im Gemeinschaftsraum / in der Küche nie andere Reisende zum quatschen oder was auch immer angetroffen (woran das gelegen hat weiß ich auch nicht).